Nonobese diabetic (NOD) mice spontaneously develop insulitis and destruction of pancreatic islet β cells similar to type 1 diabetes mellitis in humans. Insulitis also occurs in the BDC2.5 TCR transgenic line of NOD mice that express the rearranged TCR α- and β-chain genes of a diabetogenic NOD CD4 T cell clone. When activated with syngeneic islet cells in culture, BDC2.5 T cells adoptively transfer disease to NOD recipients, but the identity of the islet cell Ag responsible for pathogenicity is not known. To characterize the autoantigen(s) involved, BDC2.5 T cells were used to screen a combinatorial peptide library arranged in a positional scanning format. We identified more than 100 decapeptides that stimulate these T cells at nanomolar concentrations; they are then capable of transferring disease to NOD-scid mice. Surprisingly, some of the peptides include sequences similar (8 of 10 residues) to those found within the 528–539 fragment of glutamic acid decarboxylase 65. Although this 12-mer glutamic acid decarboxylase 65 fragment is only slightly stimulatory for BDC2.5 T cells (EC50 > 100 μM), a larger 16-mer fragment, 526–541, shows activity in the low micromolar range (EC50 = 2.3 μM). Finally, T cells from prediabetic NOD mice respond spontaneously to these peptide analogs in culture; this finding validates them as being related to a critical autoantigen involved in the etiology of spontaneous diabetes and indicates that their further characterization is important for a better understanding of underlying disease mechanisms. Type 1 diabetes, insulin-dependent diabetes mellitus, in humans is thought to be the outcome of a pathogenic autoimmune response in which several factors, both genetic and environmental, play a prominent role (1). One important factor determining genetic susceptibility in humans resides in the chromosomal region of chromosome 6 that encodes the MHC. The nonobese diabetic (NOD)3 mouse also develops diabetes spontaneously (2). Here too, genetic and environmental factors are involved, the most prominent genetic one being the H-2g7 allele of the mouse MHC complex. Because of these similarities, the NOD mouse has been a useful animal model for studies of the etiology and pathogenesis of this disease. In both species, type 1 diabetes involves an occult lymphocytic infiltration in the pancreatic islets (insulitis) followed by destruction of insulin-producing β cells mediated by T lymphocytes, ultimately leading to the failure to metabolize glucose. T cell involvement is indicated by the finding that spontaneous disease does not occur in congenic athymic or neonatally thymectomized NOD mice (3, 4, 5), and disease is diminished or prevented in NOD mice pretreated with anti-T cell reagents (6, 7, 8, 9, 10, 11). Both CD4 and CD8 subsets of T cells are thought to be involved in the spontaneous development of insulitis and β cell destruction in the NOD mouse; however, under some circumstances T cells of either subset alone, including cloned T cell lines, are capable of causing adoptive insulitis and disease in asymptomatic young NOD mice and in T cell-deficient NOD-scid recipients (12, 13, 14, 15, 16, 17, 18, 19, 20). The CD4+ T cell clone, BDC2.5 is highly diabetogenic in NOD mice (16). The best evidence for a role for CD8 T cells derives from studies showing that T cells from young, prediabetic NOD mice are capable of transferring disease to MHC class I-positive NOD-scid mice, but not to NOD-scid mice backcrossed to β2-microglobulin-deficient mice that lack MHC class I expression (21). In addition, a murine CD8+ T cell clone (G9C8), reactive to a peptide fragment of insulin B-chain, has been described that is capable of adoptive transfer of diabetes in the absence of CD4 T cells to recipients expressing H-2Kd (22, 23). Several candidate proteins have been considered as potential autoantigens in the etiology of diabetes both in humans and the NOD mouse. These include an islet granule protein (24), insulin (25), the 64-kDa isoform of glutamic acid decarboxylase (GAD) 65 (26), and heat shock protein (27). However, much of the evidence for the involvement of these putative autoantigens is indirect, based either on data showing proliferative or cytokine responses to various peptide fragments of these proteins by T cells or clones derived from prediabetic animals, or on studies showing that various pretreatments of NOD animals with these peptides/proteins reduces disease severity (25, 26, 27, 28, 29, 30, 31). Recently, it was reported that selective suppression of GAD expression in the β cells of a transgenic line of NOD mice bearing antisense GAD transgenes significantly reduced insulitis and blocked development of disease (32). However, it appears to be only a rare exception that direct administration of GAD65 or one of its fragments results in diabetes in the mouse model (26, 31). A transgenic strain of NOD mice expressing the TCR α- and β-chain genes of the BDC2.5 T cell clone (33) has been a useful model for studies of the immunobiology of a single T cell specificity in the pathogenesis of diabetes. The original BDC2.5 T cell clone was derived from a NOD mouse, is reactive to an unknown islet cell Ag in association with H-2g7, and is highly diabetogenic in young asymptomatic NOD mice (16). The TCR-transgenic BDC2.5 mouse develops an aggressive form of diabetes in some (33) but not all colonies (34), and activated T cells from these donors transfer disease adoptively to NOD-scid recipients (34). In this study, we sought to identify a series of peptides specific for T cells from the BDC2.5-transgenic NOD mouse by screening a synthetic combinatorial peptide library. We report here an extensive array of decamer peptides that stimulate these transgenic T cells at concentrations in the 700 pM-10 nM range and, when activated, these T cells cause adoptive disease in NOD-scid mice. T cells derived from prediabetic NOD mice respond spontaneously to many of these peptides in culture, a direct demonstration that T cells activated during the spontaneous onset of insulitis and diabetes include subsets having specificity for these peptide mimics. Surprisingly, some of these peptides include sequences similar (8 of 10 residues) to those found within the 528–539 fragment of the 64-kDa protein GAD65 (KVAPVIKARMME). This 12-mer GAD65 fragment is only slightly stimulatory for BDC2.5 T cells (EC50 > 100 μM), although a longer 16-mer fragment, 526–541 (LSKVAPVIKARMMEYG) is effective in the low micromolar range. NOD/shi and NOD/Lt-scid/scid female mice and NOD.BDC2.5 TCR-transgenic mice were obtained from the mouse colony maintained at The Scripps Research Institute. The generation of the BDC2.5 mouse has been described by others (33). In this colony, BDC2.5 mice do not develop spontaneous diabetes, but do develop insulitis accompanied by the appearance of activated islet-specific T cells (34). Libraries and biased sublibrary mixtures were prepared at Mixture Sciences, Inc. (San Diego, CA) as described previously (35). PCL 97-4 is a synthetic N-acetylated, C-terminal amide, l-amino acid combinatorial peptide library arranged in a positional scanning format. It consists of 200 mixtures in the OX9 format where O represents one each of the 20 natural l-amino acids in a defined position and X represents all of the natural amino acids, with the exception of cysteine, in each of the remaining positions. For example, the first mixture has alanine (A) in position 1 (A1X9) whereas mixture number 200 has tyrosine (Y) in position 10 (X9Y10). Each OX9 mixture consists of 3.2 × 1011 (199) different decamer peptides in approximate equimolar concentration, and the total X10 library consists of 6.4 × 1012 (20 × 199) different peptides. Assuming an average m.w. of 1200 for a decapeptide mixture and a concentration of 100 μg/ml (83 μM), the concentration of each individual peptide is 2.6 × 10−16 M.
Individual peptides were synthesized by the simultaneous multiple peptide synthesis method (36). Purity and identity of each peptide were characterized using an electrospray mass spectrometer interfaced with a liquid chromatography system. Whole spleen cells from 4- to 6-wk-old BDC2.5 TCR-transgenic mice were depleted of erythrocytes and cultured (200–300 × 103 cells per well) in microtiter plates in standard T cell medium containing PCL 97-4 mixtures at 100 μg/ml. Varying consecutive dilutions were used for stimulation with sublibrary mixtures and individual peptides. Cultures were harvested at 72 h following overnight exposure to 0.5 μCi [3H]TdR (6.7 Ci/mM) and incorporated radioactivity was assessed by scintillation counting. Medium used for mouse T cells consisted of RPMI 1640 (Fischer Scientific, Pittsburgh, PA) supplemented with 8% FCS (J.R. Scientific, Woodland, CA), HEPES buffer (10 mM; Sigma, St. Louis, MO), 2-ME (50 μM 2-ME; Bio-Rad, Richmond, CA), penicillin-streptomycin (5 U/ml and 50 μg/ml, respectively; BioWhittaker, Walkersville, MD), and glutamine (2 mM; Sigma). T cell populations were cultured using conditions described above with varying dilutions of peptides and sublibrary mixtures. The concentration causing a half-maximal proliferative response (EC50) was determined by curve-fitting using a scientific graphics software program (GraphPad Prism; Graph Pad Software, San Diego, CA). The maximal proliferative response was fixed using the mean of the highest values obtained in each experiment. Whole spleen cells from young BDC2.5 TCR-transgenic mice were cultured in mouse T cell medium for 4 days with selected stimulators at the specified concentrations. On day 4, 5 × 106 cells were injected i.v. into groups of five NOD-scid mice 10 wk of age. Control animals received a similar number of nonstimulated BDC2.5 T cells. Glucose levels were determined from tail vein blood samples using Glucometer Elite test strips (Bayer, Elkhart, IN) on a standard glucometer with a range of 20–400 mg/dl. Mice were monitored twice each week after cell transfer; mice with two consecutive values greater than 300 mg/dl were considered diabetic. T cells from BDC2.5 mice were stimulated in duplicate microwell cultures in four different experiments conducted at different times with the 200 mixtures of the PCL 97-4 positional scanning combinatorial decapeptide library; control cultures were left unstimulated. The results of a typical experiment (Fig. 1⇓) show unambiguous responses with stimulation indices (SI) 3–4 times over background levels to mixtures with proline defined at position 4 (P4) and methionine at position 9 (M9). At other positions a number of mixtures having different defined amino acids showed responses substantially over background levels (>1.5×). For these positions, rankings of the five most active mixtures were recorded for each experiment. The results of this analysis are summarized in Table I⇓ as “library selections”; here the amino acids recorded at each position represent the most active mixtures in at least two experiments, shown in order of decreasing activity. Because all of the possible sequences based on the selected amino acids listed in Table I⇓ would require the synthesis of >40 million different peptides, a different strategy for identifying the active peptides was required. Peptide library scan of BDC2.5 T cells. These are typical results of one experiment showing proliferative response of splenic T cells from transgenic BDC2.5 mice to the 200 mixtures of the decapeptide PCL 97-4 library arranged in a positional scanning format. The x-axis represents no stimulation (&) or stimulation with library mixtures having a defined amino acid (single letter code A, C, D, etc.) at an indicated position. The y-axis represents proliferative activity (cpm) following 3 days of culture (see Materials and Methods for details). As an alternative strategy, two series of biased decamer peptide mixtures were synthesized. The first series (N37-74P4M9 and N37-75P4Y9) was synthesized with both P defined at position 4 and M or Y at position 9 and all 19 amino acids except C at the remaining positions (X). The Y9 mixtures were included because the library mixture PCL 97-4/180 was found to be the second most active mixture, after M9 (PCL 97-4/171), in three of four scans (data not shown). Table II⇓ shows the activity of these two peptide mixtures with dual fixed positions in comparison to the single fixed position mixtures of the PCL 97-4 library. The P4 M9 mixture was substantially more active (EC50 = 43 μg/ml) compared with the others (>100 μg/ml). A substantially less diverse, second set of mixtures (N37-103) was also tested on BDC2.5 T cells. This set was synthesized based on defining P, M, and Y, either singly or in combination, at positions 4 and 9 and including the more limited amino acid selections (X1, X2, … ) shown in Table I⇑ in the other positions. The results with this second set of mixtures, including SI and EC50 values (Table II⇑), indicated that the mixture with both P4 and M9 fixed was more active (EC50 = 1 μg/ml) than those with P4 or M9 only; Y9 mixtures with or without P4 were only slightly active. Having established the requirement for the amino acids P4 and M9 in the most active mixtures for stimulating BDC2.5 T cells and the fact that the N37-103-biased sublibrary, itself, is active, the next step in the deconvolution strategy was to determine the peptides responsible for the activity of N37-103P4 M9. This was accomplished with the synthesis and screening of a positional scanning sublibrary (N66) based on the biased 103P4 M9 mixture. The EC50 values of each of the mixtures in this positional scanning biased sublibrary are shown in Table III⇓, and the most active of these, selected to make individual peptides, are indicated in Table IV⇓. In addition to activity, these selections were based on chemical character. For positions 1, 2, 3, and 5, where most of the mixtures were active, we selected those with EC50 values <2.1 μg/ml (a value three times the EC50 of the 103P4 M9 control mixture). M at position 3 was omitted because of its chemical similarity to L; E and G were both included at position 10 due to their different chemical character. From these selections, 120 different peptides (1040 series) were synthesized, and their activity on BDC2.5 T cells is shown in Table V⇓. More than half of these peptides were highly active with EC50 values ranging from 700 pM to 10 nM; these are listed, along with their sequences and EC50 values, in Table VI⇓. Having available 120 individual peptides (1040 series), many of which are highly active, makes it possible to assess the relative contributions of the different amino acids in their ability to activate proliferative responses by BDC2.5 T cells. Of the thirty most active peptides shown in Table VI⇑, all use E at position 10; most use V rather than G at position 7; and, they use either L or R at position 3. For the remaining positions, there was no clear preference of possible amino acid residues. A more complete motif analysis of all 120 individual BDC2.5 ligands is shown in Table VII⇓. Because all peptides contain P4, L5, W6, R8, and M9 (Table IV⇑), they were grouped on the basis of the amino acids defined at positions 3, 7, and 10. The results reveal an obvious motif correlation with activity, the most optimal motifs being R3V7E10, L3V7E10, and L3G7E10; 42 of 62 peptides with EC50 values <10 nM use these motifs. In contrast, the least optimal motif was R3G7G10; 10 of 13 peptides with EC50 values >100 nM use this motif. Searches of the SWISS-PROT and TrEMBL data bases with the ScanProsite program (available at http://www.expasy.ch/tools/scnpsit2.html; February, 2000) using the amino acid predictions (Table I⇑) used in the synthesis of the N37-103P4 M9 mixture, with P4 and M9 defined, revealed no relevant matches. However, a search of the MHC motif binding database at the SYFPEITHI website (http://www.uni-tuebingen.de/uni/kxi/) for peptides that bind to the MHC class II molecule of the H2-g7 haplotype revealed that, except for a 2-aa insert, a fragment of GAD65 524–543 (SRLSKVAPVIKARMMEYGTT) has 9 residues (noted in bold) in common with the residues that comprise the N37-103P4 M9 mixture (Table VIII⇓). Based on this finding, we assessed the activity on BDC2.5 T cells of a series of overlapping decapeptides within the GAD65 524–541 sequence. 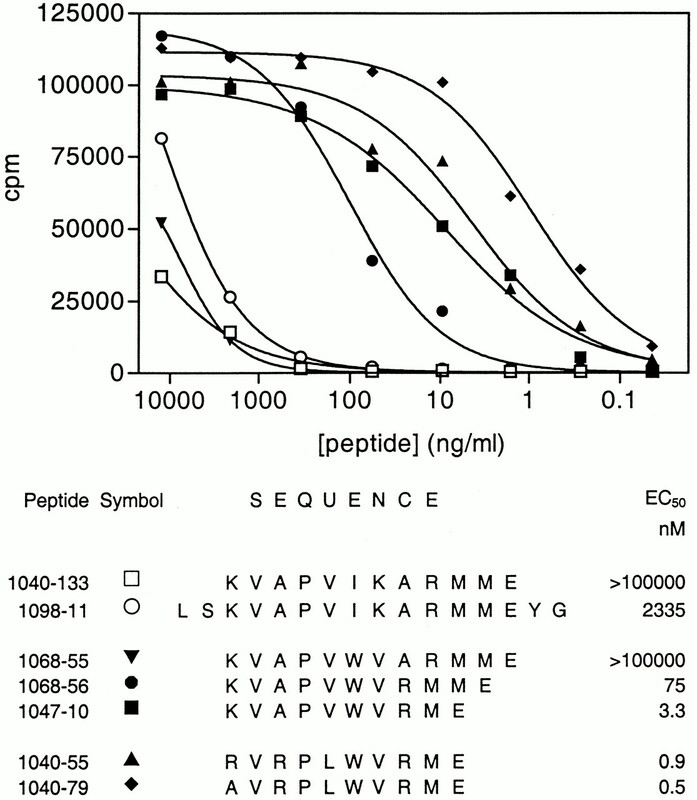 None of these peptides were found to be active (Table VIII⇓). However, the N37-103P4 M9 mixture was active in stimulating BDC2.5 T cells (EC50 = 1 μg/ml; SI = 16), an indication that altered peptide sequences imposed on a basic GAD backbone sequence might be effective. Accordingly, a series of five different decamer peptides were synthesized (Table VIII⇓; 1047 series, peptides 1–5) For these peptides, seven positions were defined from the GAD sequence: V2, A3, P4, V5, R8, M9, and M10; amino acid selections for the other positions were based on the preferences defined from the 103P4 M9 scan (Table IV⇑) and activity of the 1040 series (Tables VI⇑ and VII⇑). K1 was included because of its presence (K528) in the GAD65 sequence. 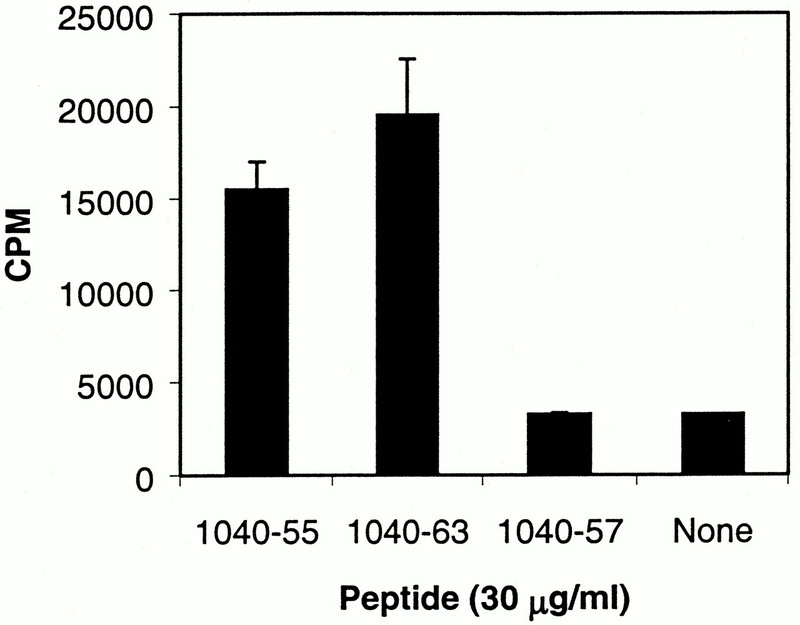 EC50 activity of these peptides was found to be in the 30 ng/ml to >1 μg/ml range. A second series of similar peptides (Table VIII⇑; series 1047, peptides 6–10) were synthesized with E at position 10. This substitution of M10 with E10 was based on the fact that most of the active peptides derived from the library deconvolution (Table VI⇑) used a terminal E10. This synthesis resulted in GAD-like peptides having a 1000-fold improvement in their EC50 activities on BDC2.5 T cells in the low nanomolar range. As an attempt to maximize similarity to GAD while retaining the ability to stimulate BDC2.5 T cells, we synthesized a 12-mer peptide (1068-55) having five N-terminal amino acids and five C-terminal amino acids of the GAD65 sequence while substituting I and K at positions 6 and 7 with W and V. This peptide proved to be only slightly active (EC50 > 100 μg/ml; SI = 11). However, a similar, 11-mer peptide, in which A8 was deleted, showed activity in the 100-nM range. Finally, we explored the possibility that a longer fragment of this GAD65 region might be effective. An N-terminal-acetylated 16-mer fragment, 526–541 (LSKVAPVIKARMMEYG), was shown to be active with an EC50 of 4.3 μg/ml (2.3 μM) and an SI of 17 at 1 μg/ml (Table VIII⇑). Fig. 2⇓ shows a summary of the similarities of active peptides and the GAD65 528–539 sequence. The principal findings are 1) the 12-mer GAD 528–539 sequence (p1040–133) is only marginally active (>100 μg/ml); 2) substituting W and V in positions 6 and 7 (p1068-55) results in no improvement; 3) an 11-mer peptide (p1068-56) with these substitutions and a deletion of A8 in the GAD sequence shows substantially improved activity (100 ng/ml); and 4) a decamer peptide (p1047-10), also with these W6 and V7 substitutions, and A8 and M9 deletions, terminating with E10, shows even greater improvement in activity (4.2 nM). Finally, the native GAD65 sequence 526–541 shows activity in the low micromolar range. Also shown for comparison are two of the most active superagonist peptides (0.7–1.2 nM) derived from the library deconvolutions. Comparative proliferative activities of the BDC2.5 mimics, GAD and GAD-like peptides. Proliferative responses by BDC2.5 T cells were stimulated with the GAD65 peptides 528–539 and 526–541 (1040–133 and 1098–11), the GAD65-like peptides (1068–55, 1068–56, and 1047–10), and two BDC2.5 mimics (1040–55 and 1040–79). Nucleotide sequence determinations of the GAD65 gene were derived from studies with DNA from the C57BL/6 mouse (37). The striking sequence similarity between some of the peptides most active in the nanomolar range on BDC2.5 T cells and the inactive GAD65 528–539 fragment raises the possibility that the GAD65 gene might express a different polymorphism in the NOD mouse. To explore this, a PCR-amplified cDNA fragment of GAD 524–541 derived from NOD brain tissue was sequenced, but found to be identical with that established by others (data not shown) (37). Results shown in Table IX⇓ explore the pathogenicity in vivo following adoptive transfer of BDC2.5 T cells after stimulation in culture with selected peptides or a biased sublibrary mixture. Cells activated with the marginally active peptide, GAD65 528–539 (1040-133, EC50 > 100 μg/ml), and cells stimulated with the biased library mixture (103P4 M9) caused diabetes in all of NOD-scid recipients within 2 wk following transfer. Disease onset appeared more promptly in recipients of T cells stimulated with the superagonist peptide (p1040-63). To determine whether T cell populations from prediabetic NOD mice that are spontaneously activated during the course of disease onset contain subsets that are specific for and respond to the BDC2.5 ligands defined from the library deconvolution in this study, we isolated draining pancreatic lymph node cell populations from 7-wk-old prediabetic NOD mice; these were cultured with three different superagonist mimics (30 μg/ml). The results (Fig. 3⇓) show unambiguous proliferative activity by T cell populations in response to two of these peptides, a clear indication that at least a portion of the T cell population in prediabetic NOD mice activated during the course of onset of spontaneous disease are reactive to the BDC2.5 ligand mimics. Reactivity of T cells from prediabetic NOD mice with mimic peptides. Pancreatic lymph node cells were isolated from 7-wk-old prediabetic NOD mice; these were incubated for 3 days (3 × 105 cells/well) with 30 μg/ml of peptides 1040–55, 1040–63, and 1040–57 for 3 days in the presence of irradiated syngeneic spleen cells (3 × 105 cells/well). Several strategies have been used to identify Ags recognized by T cells thought to be involved in the onset of spontaneous insulin-dependent diabetes mellitus in mice and humans. We opted to search for the Ag recognized by the highly pathogenic clonotypic T cell population present in NOD mice made transgenic for the TCR α- and β-chains derived from the diabetogenic CD4+ T cell clone, BDC2.5. The original BDC2.5 T cell clone was derived from a NOD mouse, is highly diabetogenic when transferred to young asymptomatic NOD mice, and is reactive to an unknown β cell islet Ag in association with H-2g7 (16). This search for the BDC2.5 ligand(s) was conducted with the use of a synthetic combinatorial peptide library arrayed in a positional scanning format, an approach that has been used previously to identify a large series of peptide ligands specific for T cell clones reactive to series of known and unknown Ags (38, 39, 40, 41, 42, 43, 44). The initial scan with the PCL 97-4 library (Fig. 1⇑) indicated that mixtures with P4 fixed and others with M9 fixed were most active in stimulating BDC2.5 T cells; mixtures with other fixed amino acids at these two positions were also active, but somewhat less so. In addition, numerous mixtures with defined amino acids at the other positions were active but no one mixture seemed to show unambiguous activity. This substantial number of amino acid possibilities at each of the positions (Table I⇑) precluded synthesis of such a large array of candidate sequences and their activity assessments on BDC2.5 T cells. This situation required us to develop a different strategy using a biased positional scanning sublibrary for the identification of T cell ligands contained in the active mixtures. Although biased positional scanning libraries have been used by others for identification of peptide ligands for T cell clones (45, 46), to our knowledge, this is the first time a biased positional scanning sublibrary has been designed based on results obtained from scans made with an unbiased positional scanning library. The first step was to synthesize a series of biased sublibrary mixtures based on the library selections of Table I⇑ and to assess their activity on BDC2.5 T cells. For example, mixture N37-103, containing ∼1000-fold fewer peptides than the PCL 97-4 mixtures, showed a substantial degree of activity (Table II⇑). This finding clearly indicates that this less diverse biased sublibrary mixture contained a subset of active peptide ligands. 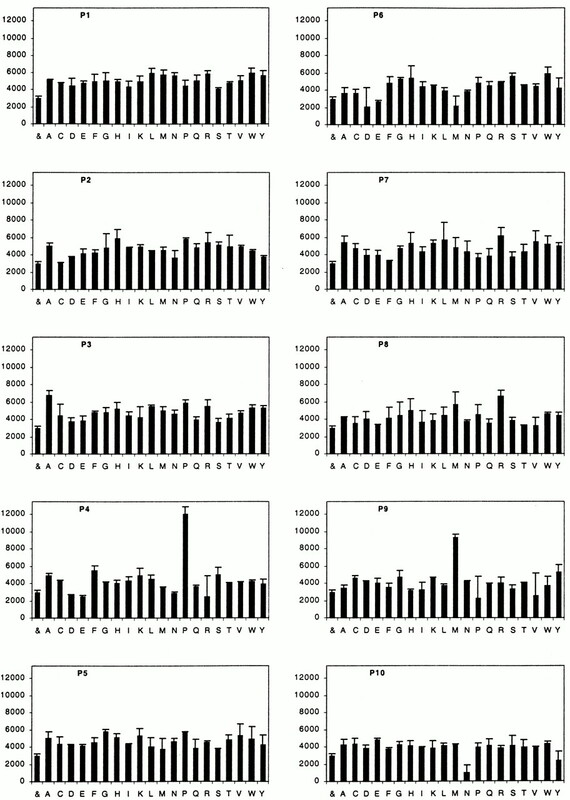 Moreover, the substantial increase in activity of the biased mixture N37-103P4 M9 clearly indicates the importance of P and M in positions 4 and 9 of the active peptides, and permitted continuation of the deconvolution process with fewer possible amino acids for each position. The next step was to construct a positional scanning sublibrary based on the N37-103P4 M9 mixture and to assess its activity on BDC2.5 T cells. From these results (Table III⇑), it was possible to eliminate two-thirds of the amino acid possibilities of Table I⇑ and to focus on a less diverse array of possible candidate residues important for stimulating proliferative activity (Table IV⇑). Of the 120 different possible peptide sequences that were synthesized based on the library predictions of Table IV⇑, more than half proved to be highly active with EC50 values in the 0.1–10 nM range (Tables V⇑ and VI⇑). Having successfully identified peptide ligands with this deconvolution strategy clearly demonstrates that when the activity of a highly complex mixture (i.e., PCL 97-4, N37-103, or the N66 series, Tables II⇑ and III⇑) is reproducible, active individual compounds can then be identified. During the different steps of the deconvolution process, in which mixtures or individual compounds were assessed by their ability to stimulate BDC2.5 T cells, it was found that the presence of P4, L5, W6, R8, and M9 were important for activity. Also, it was possible to determine optimal amino acid motifs present in the most active peptides (R3 V7 E10, L3 V7 E10, and L3 G7 E10) based on activity assessments of all of the individual peptides (1040 series, Tables IV⇑ and VII⇑). In addition, peptides identified in this study were aligned with the proposed MHC binding motifs for H-2g7 recently described with peptide binding competition assays (47) and the recent x-ray structure of H-2g7 complexed with peptide (48). This analysis revealed that the amino acids found to be important at positions 5, 7, and 10 correspond to the anchor residues for the MHC pockets 4, 6, and 9. More importantly, this finding suggests that P4, W6, R8, and M9 are likely to be involved in TCR recognition. Studies that address the importance of these residues using alanine substitution analogs clearly demonstrate that peptides having the H-2g7 binding motifs but with substitutions at proposed TCR contact residues are not stimulatory (data not shown). We are currently using the information obtained with the screening of the peptide library and the activity of the individual peptides in conjunction with a biometrical analysis (44) to search protein databases to identify murine, viral, and bacterial sequences that could be potential candidates for triggering activation of this diabetogenic T cell clone. A number of sequences within known proteins have already been identified, and the biological relevance of these sequences is currently under study. The BDC2.5 ligands defined in this study are highly active in stimulating BDC2.5 T cells (Table VI⇑), these activated cells cause a prompt onset of disease in NOD-scid animals (Table VIII⇑), and more importantly, they are capable of stimulating polyclonal T cell populations from young, prediabetic NOD mice that have been spontaneously activated in vivo (Fig. 3⇑). This latter finding implies that these peptides are related to a critical autoantigenic epitope underlying the disease process in these animals. Further, assuming that the spontaneously activated T cell subset in autoimmune diabetes in NOD animals is polyclonal, it indicates that the specificity of the BDC2.5 T cell clone for this set of peptide mimics is shared by numerous different cells in the NOD T cell repertoire that may be involved in the disease process. Does direct immunization of prediabetic NOD mice with these active peptides cause accelerated disease onset? These BDC2.5 ligands are effective immunogens; they provoke strong T cell responses in culture but, to date, we have not been able to cause accelerated diabetes in these animals in vivo (studies in progress). Nevertheless, the availability of an extensive array of peptide mimics that stimulate BDC2.5 T cells provides an important probe for the further exploration of molecular details of TCR/peptide/MHC interactions involved in autoimmune diabetes at the level of a single clone. Is GAD65 or one of its fragments causally involved in the etiology of spontaneous diabetes? This enzyme has long been suspected as one of the diabetogenic autoantigens in both man and mouse, although much of the evidence for its involvement is indirect (25, 26, 27, 28, 29, 30, 31). Stronger support for this possibility is provided by the recent demonstration in NOD mice bearing anti-sense GAD transgenes that selective suppression of GAD expression in pancreatic β cells both reduced insulitis and blocked development of disease in these animals (32). In this study, one of the most active peptides in stimulating pathogenic activity by BDC2.5 T cells, 1047-10 KVAPVWVRME with an EC50 = 4 nM, is remarkably similar to the sequence of GAD65 528-539 (KVAPVIKARMME) although the latter shows only minimal activity (Fig. 2⇑). More telling is the finding that a longer GAD65 fragment, 526–541 (LSKVAPVIKARM MEYG), shows activity in the low micromolar range (Table VIII⇑ and Fig. 2⇑). This result adds further support for the possibility that an epitope within this region of the GAD65 sequence is the native autoantigen peptide involved in the spontaneous activation of the original BDC2.5 T cell clone. If so, the BDC2.5 T cell clone appears to have low avidity for this peptide/MHC complex, but sufficient to cause spontaneous disease. However, two problems remain with this notion. First, only rarely has deliberate delivery of GAD65 or one of its fragments to prediabetic NOD mice been associated with more rapid onset of disease (26, 31). Second, as indicated above, the mimic peptides (some of them very similar to the relevant GAD fragment) that are highly active on these cells in culture have not yet been shown to cause disease in vivo. These findings appear to indicate that the circumstances involving natural (auto)antigen presentation during onset of spontaneous disease in vivo and Ag presentation following deliberate immunization lead to quite different outcomes. An alternative explanation derives from the fact that native GAD65 fragments fail to cause accelerated diabetes in NOD mice following direct immunization. This might reflect the presence of T cells in the NOD repertoire with low affinity for this peptide/MHC complex, and that the disease-causing epitope in NOD mice is a cross-reactive peptide derived from a different protein. The possibility that NOD mice express an allelic difference reflected in the GAD sequence was explored by direct sequence analysis of GAD65 cDNA and found not to be different from the previously reported sequence. Recently completed studies by Quinn and colleagues provides an interesting set of findings that should be considered in the context of the current results described above and provide some insight that may ultimately help to resolve this conundrum.4 They show that the GAD65 524–543 sequence contains two overlapping epitopes that stimulate two functionally different sets of T cells with different TCR β-chains. T cells from NOD mice immunized with the 524–543 fragment respond in culture to 527–538, use Vβ12, and display regulatory activity by protecting against disease onset. In contrast, T cells from young prediabetic NOD mice spontaneously respond to 530–543, use Vβ4, and show no such regulatory activity. It is of some interest that one of the GAD-like mimic peptides (1047-10) described here, highly active on BDC2.5 T cells that use TCRVβ4 and capable of inducing pathogenicity by these cells, contains 8 residues in common with the intermediate GAD65 528–539 sequence. Studies currently in progress are designed to determine whether this mimic peptide provokes conflicting responses in vivo involving both of these T cell subsets. In summary, we report here for the first time a large series of peptide sequences that are highly specific, with EC50 values in the picomolar to low nanomolar range, in stimulating pathogenicity by clonotypic T cells of the BDC2.5 NOD mouse. Several of these peptides are structurally similar to a fragment of GAD65, and a 16-mer fragment of GAD65 stimulates these T cells with an EC50 value in the low micromolar range, findings that support the notion that this protein may be a key factor in autoimmune diabetes. BDC2.5 cells stimulated in culture with these highly active peptide analogs transferred adoptively prove to be highly diabetogenic in vivo. The mimic peptides also stimulate proliferative responses by spontaneously activated T cells derived from prediabetic NOD mice, a finding that indicates that one of the events involved in spontaneous onset of autoimmune diabetes in the NOD mouse involves activation of a significant fraction of the T cell repertoire having specificity for a peptide ligand structurally similar to these peptide mimics. We thank colleagues at Mixture Sciences, Inc. (San Diego, CA) for the combinatorial peptide library. Also, we are grateful for the assistance of Drs. Zhong Chen and Howard Fox, The Scripps Research Institute, for the PCR analysis of GAD65 cDNA from NOD mice. Finally, we appreciate the numerous helpful discussions that occurred with Drs. Anthony Quinn and Eli Sercarz. ↵1 This work was supported by National Institutes of Health Grants AI-22519, CA-78040 (to D.B.W.) and the Diabetes Interdisciplinary Program of the Juvenile Diabetes Foundation International (to N.S.). ↵3 Abbreviations used in this paper: NOD, nonobese diabetic; GAD65, glutamic acid decarboxylase; SI, stimulation index/indices. 4 A. Quinn, B. McInerney, E. P. Reich, O. Kim, K. Jensen, and E. E. Sercarz. 2000. Regulatory and effector CD4 T cells in NOD mice recognize overlapping determinants on GAD65 and use distinct Vβ genes. Submitted for publication.